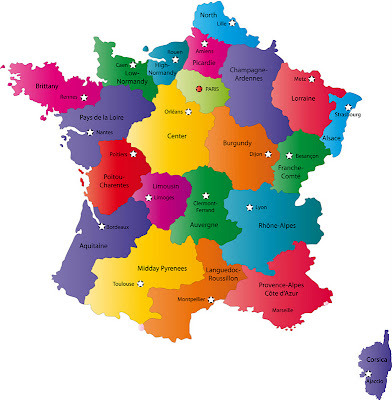 Many people have asked where Egletons, France is, so I thought I would give you all a quick lesson. I feel bad because a few people have reached out to me because they will be in Paris for a few days and want to meet up, but unfortunately (and fortunately) we are in the heart of Central France and a 4.5 hour drive from Paris... so we are more countryside than city down here. I wish we could zip up to Paris on a whim, but alas, we usually can't. Limousin is divided into 3 departments. 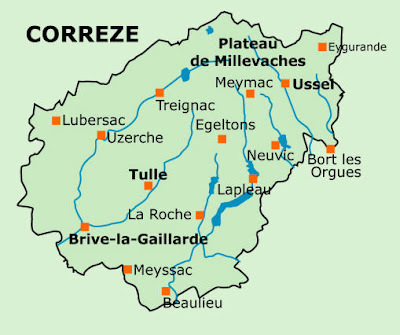 (Like counties Ex: DFW Area or Tarrant County) We are in the Correze department so that is why all of our Frenchy license plates will read "19. "It's kind of neat when you drive, because you can identify where everyone is from by the number at the end of their license plate. GO 19!!! Correze (The Department) has several cities including EGLETONS. Tulle and Brive are the two that we frequent the most when we want to go shopping for something we can't find in Egletons. (Like an H&M!) Brive is only a 45 minute drive from us so that can give you perspective on the size of our department. It is BEAUTIFUL down here. You can't beat the rolling hills of the French countryside. I hope you learned something. If you forget, just remember if you threw a rock to the center of France, it would most likely land near Egletons. thank you. cannot wait to see it in person! i absolutely love everything about that geography lesson. we, americans, can only think of things in relation to america! I've had the exact thing happen to me, loads of people will tell me that they're going to be in Paris and I'm like, uh, that's not right next door.